The GefenToolBox GTB-HD4K2K-642-BLK 6x2 Matrix for HDMI 4Kx2K is a compact and lightweight alternative to rack-mounted matrixes. It allows up to six Ultra High Definition 4K x 2K or 1080p Full HD sources to be routed to up to two Ultra HD displays. The GTB-HD4K2K-642-BLK supports resolutions up to 4K x 2K (3840 x 2160 @ 30Hz). Deep Color, 3DTV pass-through, and lossless audio formats such as LPCM 7.1, Dolby TrueHD, and DTS-HD� Master Audio are also supported. 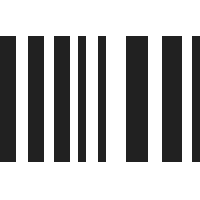 In addition to through HDMI, digital audio can also be outputted via the two TOSLINK optical connectors for use with digital audio processors. Each Hi-Def source can be routed to either of the connected displays using the front panel push-button controls, the included IR remote, RS-232 serial control interface, or through IP, using Telnet, UDP, and the built-in web server interface. LED indicators on the top panel display the current routing status, FST mode, audio configuration, and EDID settings. Connect up to six Ultra Hi-Def sources to the HDMI inputs on the GTB-HD4K2K-642-BLK matrix using HDMI cables. Connect up to two Ultra HD displays to the HDMI outputs. 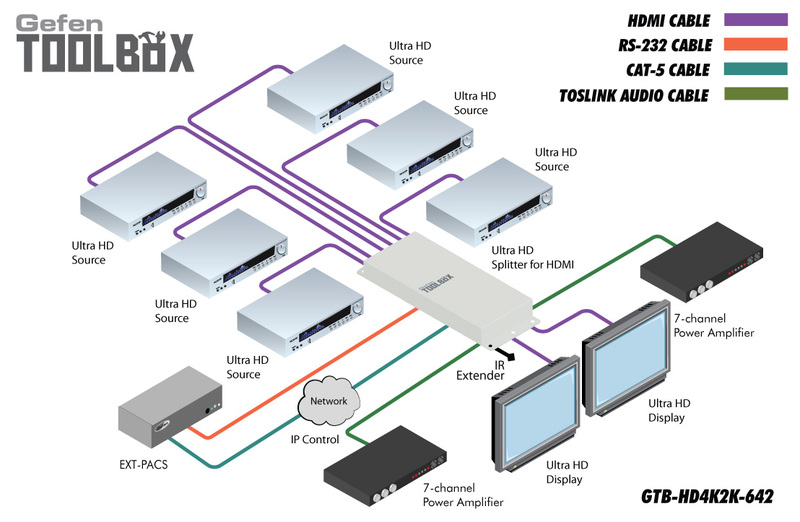 Using TOSLINK cables, connect up to two A/V Receivers to the Optical outputs. Connect an Ethernet cable from the network to the RJ-45 connector to use the built-in web server or Telnet /UDP capability to control routing, EDID management, and other functions. Connect an RS-232 cable between an automation control device such as Gefen EXT-PACS and GTB-MINI-PACS and the matrix. Connect the included locking power supply to the matrix and to an available electrical outlet. Apply power to the source and displays. The HD sources can now be routed to the displays using the front panel push-buttons, IR remote control, RS-232, Telnet, UDP, or web server interface. Question: With the GTB-HD4K2K-642-BLK, can the outputs simultaneously display different inputs (i.e., the outputs are not mirrors of each other)? Also for more information on operating the GTB-HD4K2K-642-BLK and routing the video inputs, please feel free to refer to the Gefen GTB-HD4K2K-642-BLK Manual starting on page 12.